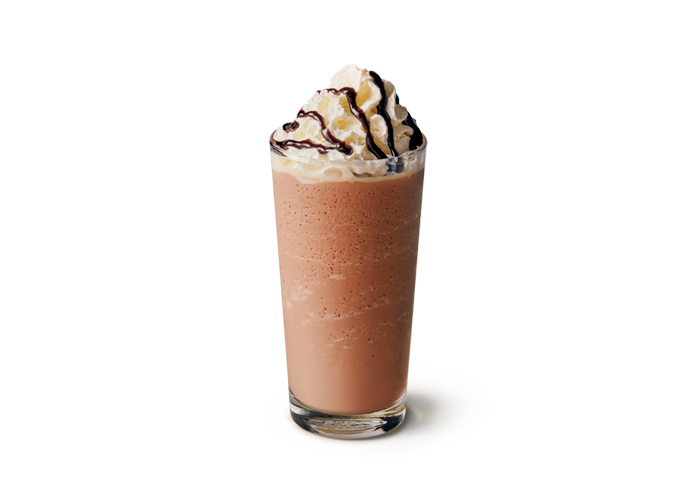 Treat yourself with the delicious new Mocha Frappé, with whipped cream and finished with an indulging swirl of chocolate topping. COFFEE FRAPPE BASE SYRUP: Milk, Sugar, Cream, Water, Milk Solids, Coffee Powder, Emulsifier (471), Stabilisers (412, 410, 466, 407a, 407), Flavours. CHOCOLATE FRAPPE BASE SYRUP: Milk, Sugar, Cream, Water, Milk Solids, Cocoa Powder, Emulsifier (471), Stabilisers (412, 410, 466, 407a, 407), Chocolate Flavour. WHIPPED CREAM: Cream, Propellant (Nitrous Oxide), Emulsifier (471), Flavour, Vegetable Gums (401, 407). COFFEE SAUCE: Sugar, Water, Flavours, Cocoa Powder, Thickener (1442), Colour (150d), Salt, Food Acids (330, 331), Preservative (202), Vegetable Gums (415, 417, 401). Contains milk. May contain TRACES of sulphites.